Bughuul is back! But what can he do for an encore? The horror-movie faithful already know what drives the death-metal-looking bogeyman from 2012’s Sinister: He and his band of pre-adolescent phantasms influence children to kill their families and film the murders on Super 8, before carrying them off into a literal celluloid underworld. It was clever of director Scott Derrickson and co-writer C. Robert Cargill—who broke into screenwriting after penning reviews for Ain’t It Cool News under the pseudonym Massawyrm—to imbue motion pictures themselves with talismanic powers. Watching Sinister, it often felt like the movie might murderously break the fourth wall at any moment. But though the duo has returned to write the inevitable sequel—with Ciarán Foy, who helmed the 2012 Irish horror flick Citadel, taking over directorial duties—there’s little evidence of the first film’s wit and slow-build tension. The sole holdover from Sinister is Deputy So & So (James Ransone), a character who worked very well as comic relief, but who is ill suited to leading man duties. (A little of his bug-eyed twitchiness goes a very long way.) Since the end of Sinister, he’s been traveling around the country burning down homes that he believes are under Bughuul’s influence. At his latest stop—a decrepit, isolated farmhouse—he comes across Courtney Collins (Shannyn Sossamon), who is hiding out with her two sons, Zach and Dylan (real-life brothers Dartanian and Robert Daniel Sloan), from her abusive spouse, Clint (Lea Coco). Dylan also happens to be having visions of Bughuul’s spectral posse, who are trying to tempt him to the dark side. Ellison Oswalt, the true-crime writer played by Ethan Hawke in Sinister, was completely in the dark as to the villains’ otherworldly motives. Derrickson and Cargill’s twist here is to show viewers every step of Dylan’s temptation, as the callow phantoms hack away at his morality like peer-pressuring ignoramuses in an after-school special. Eardrum shattering jump-scares are, of course, de rigueur. Yet not a moment of Sinister 2 is convincing or frightening, mostly due to the uber-stilted child acting and the flat, overlit visual palette, which pales in comparison to what Derrickson and cinematographer Chris Norr achieved on the shadow-laden first film. There’s a kernel of a good idea here about how abuse is a beast in and of itself, with Bughuul representing, to some degree, the Collins family’s demons made flesh. 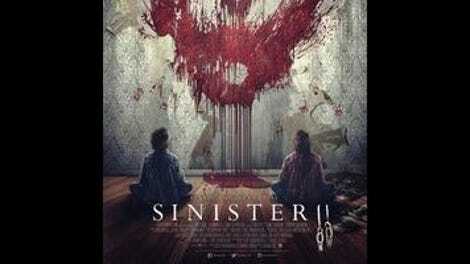 Yet Sinister 2 never delves deep into that thematic thread, preferring to expand its mythology in the way of so many diminishing-returns horror sequels. Because if there was one thing Bughuul needed, it was a convoluted backstory, this one having to do with his appearance across the centuries and through all forms of artistic expression. Movies are just the monster’s latest medium. Hopefully this sorry sequel will prove to be his last.